Sustained interest in the historical and architectural significance of the 700+/- lighthouses in America has stimulated major efforts to restore and preserve these navigational treasures. The restoration process frequently involves the determination of the colors and composition of the original paint or clear coat finishes. This includes those on exterior as well as interior surfaces, from tower rooms to watch decks and lanterns. Historic documents, both written and photographic, contribute significant information to the research effort. For example, old photographs can reveal the use of distinctive day marks on conical masonry lighthouses. These day marks employ uniquely placed colors that differentiate each lighthouse. 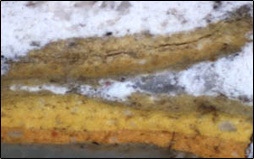 Written documents, such as the early 1900’s lighthouse survey conducted by the Lighthouse Board of the Department of Commerce and Labor, can provide detailed information not only about the structures at each site, such as Keeper’s Quarters and Oil Houses, but also the nature and colors of the paints on the buildings at the time of the survey. Welsh Color and Conservation, Inc. has consulted with architects and preservation professionals on the restoration of more than 15 lighthouses throughout the country. We have visited most of these in order to investigate and subsequently analyze the nature and color of the original finishes. For the few that we have not visited, samples were taken by our clients and mailed to us for lab analysis. Of those 15 lighthouses, three are featured here because of their history and appealing coloration. 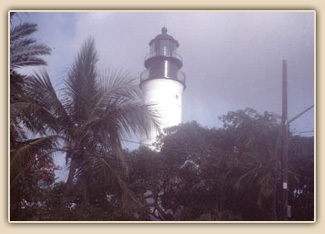 Key West Lighthouse, Key West, Florida: Built in 1847, it is the 15th oldest lighthouse in the country. We determined that it was originally painted white with a black lantern. 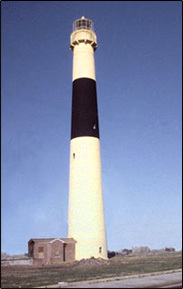 Absecon Lighthouse, Atlantic City, New Jersey: Built in 1857, it was designed by General George Gordon Meade. We determined the black and yellow colors of its ca. 1925-1933 three-band day marking. 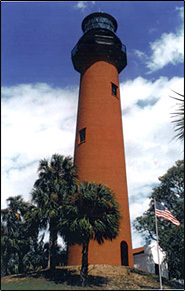 Jupiter Lighthouse, Jupiter, Florida: Built in 1855, it too was designed by General Meade. We determined that it was originally painted reddish brown with a black lantern.